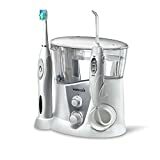 One of the most important things to decide when purchasing a Waterpik water flosser is whether the countertop or cordless type suits your needs best. We get started by comparing these two types to help you choose between them. In terms of countertops, after careful consideration we concluded that the Waterpik Sidekick is the best! It’s also the most expensive at around $100. However, we think you can get the same great results with the Aquarius which is some $30 cheaper. Read why below. In terms of cordless, different models really do suit different needs. We help you match your specific needs with the right model below. Why should I use a Water Flosser? Flossing matters. A LOT. It protects both your oral AND systemic health. String flossing is awkward, slow, boring, painful or even smelly! Water flossing is easy, fast and fun and up to twice as effective at removing plaque than string flossing. Before considering which model is best for you, it’s important to understand the differences between the two types of flosser available. So, let’s get started and help you choose the best Waterpik type for your needs. Countertop or cordless Waterpik water flosser? There’s a fundamental difference between the various Waterpik models. Some are countertop. Some are cordless. Before we go in deeper, let’s just look at the basic differences between these two types to help you decide which one is better for you. But remember, all Waterpik water flossers give clinically proven benefits. Size and portability Usually left on countertop and requires a shaver socket. Waterproof cordless models can be used in the shower. A countertop model is best as it has a larger range of pressures, a bigger reservoir and more flosser tips for use by multiple family members. However, you do need a shaver socket in the bathroom as well as countertop space. Cordless water flossers suit bathrooms with limited space or which do not have a shaver socket, travellers who wish to use the flosser away from home and time starved users who want to use their flosser in the shower. Ready to incorporate a Waterpik countertop into your daily routine? How can you ensure that you are getting the right model for your teeth and gums? Well here we provide a side-by-side comparison of the Waterpik Complete Care 7.0, Waterpik Aquarius and Waterpik Ultra and the benefits of each in helping to optimise your daily, dental hygiene routine. The Complete Care 7.0, Waterpik Aquarius and Ultra models have many similarities. These relate to reservoir capacity, pressure settings, 360-degree rotating tip and star ratings. And all have a 3 year warranty. We think the best model to go for is the Aquarius. It lots of advanced features yet it’s a similar price to the Ultra. All it lacks is the toothbrush that comes with the Complete Care and many of you will have one of these already. We’ll look at the precise differences between these these different models a little later. Thinking of splashing out on a cordless model? Let’s see what differentiates one cordless model from the other and help you choose the right one for your needs. As you can see, there’s more differences between the Cordless models compared to the Countertop. We look more closely at these below. But in a nutshell, the Freedom will best suit frequent international travellers as its power source is 3xAA batteries. Otherwise, go for the Advanced. Not least because it has the American Dental Association seal of approval. This is universally recognized by consumers as a symbol of effectiveness. Now for the nitty gritty. Here we provide concise, but detailed, reviews to really help you see what differentiates one Waterpik model from another. The key difference with the complete care is it includes a rechargeable toothbrush with changeable heads. You can store these, together with Waterpik tips, in a ventilated storage area in the unit. There’s also a handy travel case for the toothbrush. Many users claim the brush cleans better than any other they have tried. There are fewer tips with this model than with the Aquarius. However, the range of tips included do allow multiple users and cover a range of needs. There are two classic jet tips (for general use), one orthodontic tip (perfect for those with braces), a plaque seeker tip (great for bridges or crowns) and a pick pocket tip (for reaching deep into periodontal pockets). Tips are explained in greater detail below. It’s a single system that cares for all your oral health needs. The brush is acknowledged by many users to be better than other brands and Waterpik are already number one for water flossers. Handy ventilated storage unit for accessories. Battery in the brush is not replaceable so once it stops taking charge the brush must be replaced. Fairly large footprint so you do need the countertop space for it. The Aquarius has a timer feature, colour options, more tips and a massage mode. It also has a flossing tip storage area. So firstly the tips. The Aquarius has the same range of tips as the Complete Care. However, it has an additional Classic Jet Tip and a Toothbrush tip, which allows you to brush and floss at the same time. The Aquarius also has a timer/pacer function. Many users on Amazon love this feature, feeling that they might stop flossing sooner if it wasn’t there. It also has a massage mode that helps to stimulate circulation in your gums. This helps gums heal and fight infections more quickly. Great range and number of tips. Timer/Pacer mode that helps you floss for the correct length of time. Massage mode that can stimulate blood flow and help gums heal and recover more quickly. Those users who make use of it love it! Brushing tip – allows you to brush and floss at the same time. More attractive and smaller than the Ultra. Available in white, blue or black. Designer model also in orchid, teal and pink. Storage unit only stores two tips. Bristles on brushing tip soon splay so it would need fairly frequent replacing. The only thing the Ultra has that the Aquarius doesn’t is the capacity to store all the tips in the unit. It has the same range of tips, but has 2 Classic Jet tips as opposed to 3 on the Aquarius. The Ultra has a push button control on the handle that must be held down during use. It’s also a pound heavier than the Aquarius with a bigger footprint. As we mentioned before, the Aquarius has a massage mode. However, some Ultra users claim it’s possible to massage your gums by reducing the pressure on the Ultra and pressing and releasing the push button repeatedly. How much wear this causes to the push button mechanism they don’t say! For fans of the Ultra, the Aquarius does not offer a great deal more for the extra expense. However, for fans of the Aquarius the extra expense is well worth it! Storage for all the tips. Older but well established model. Button you have to hold down on the handle. Heavier and larger than the Aquarius and not as attractive. Has less features and is around the same price as an Aquarius. If you don’t already use an electric toothbrush, or are looking to replace your old one, go for the Complete care. Otherwise it has to be the Aquarius. Especially as the Aquarius has recently dropped in price. It’s smaller and more stylish than the Ultra and has several colour options. But most importantly it scores an impressive 4.7 out of over 10,000 reviews. This is a powerful endorsement of the innovation that has gone into this model. Long standing Ultra users may argue the case. The fact that they are so fiercely loyal to their product, in the same way that Aquarius users are equally loyal to theirs, speaks volumes for both products and the company that makes them. The Waterpik Plus offers four tips. There are two classic jet tips (for general use), one orthodontic tip (perfect for those with braces, and a plaque seeker tip (great for bridges or crowns). There are two pressure settings to suit different uses and users. This model is rechargeable and is offered in two colours. 45 seconds of flossing time. Complaints about the battery not holding charge well over time. 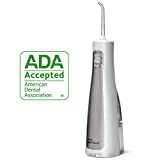 First in category - Waterpik Water Flosser awarded the American Dental Association (ADA) Seal of Acceptance. 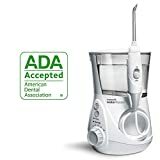 Advanced Cordless Water Flosser design with 3 pressure settings, 45 seconds of water capacity, and 4 flossing tips (2 Classic, 1 Plaque Seeker, 1 Orthodontic) for a variety of dental needs. Rechargeable battery features a rapid magnetic charging system; convenient LED battery indicator lets you know when it's time to recharge. The Advanced has the same number and range of tips as the Plus. 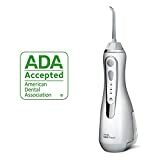 However, unlike the Plus, the Advanced is the first in its category to receive the American Dental Association (ADA) Seal of Acceptance. Also, it charges in four hours, much faster than competitor products. And it has three pressure settings: low, medium and high to allow for a wider range of users and uses. What’s more, it can be used in the shower! Finally it comes in a wider range of colours: brilliant black, classic blue, pearly white, radiant orchid and rose gold. A few customers still report charging issues but Waterpik have replaced units where necessary. The Waterpik Cordless Freedom is truly portable. Other cordless Waterpiks have to be recharged. And they can only be recharged on 120V. If you’re an international traveller this is a limitation. However, the Freedom uses AA batteries as its power source. Even better, these are provided in the box so you don’t have to take the batteries out of your TV remote to get started! A handy travel pouch is also provided. There are fewer tips than with the Advanced or Ultra. These include 2 Classic Jet Tips and a Plaque Seeker tip. There are also only two pressure settings, compared to three on the Advanced. The reservoir is small and allows for only 30 seconds of flossing before it must be refilled. However, since Waterpik recommend you floss for 60 seconds, you will need to refill all their cordless models for the full flossing experience. Truly portable and can be used when travelling. If you want to use Waterpik’s extensive range of tips whilst travelling internationally, then the Freedom is your only choice. However, if you’re looking for a Water Flosser to use at home – or in countries using US voltage – then go for the Advanced. It’s quicker to charge and you can use it in the shower. It also has the ADA Seal of Approval – the first product of its type to receive this. A key difference between Waterpik models are the number and range of tips included. Changing tips for another purpose is quick and simple. This is great for multiple users and uses. So here’s a quick overview of tip types to help you choose a model that offers the experience you need. But don’t forget, most tips are available separately on Amazon. The standard water flossing tip with the hard-plastic end supplied with every Waterpik device. Two members of your household can utilise the tips straight out of the box since two are included and color-coded. Great for dental work like crowns, implants, and veneers. This tip is clinically proven to remove up to 99.9% of plaque from treated areas in 3 seconds. It’s 2x as effective as string floss for improving gum health around implants. Composed of a tapered brush, this tip helps to remove hard-to-reach plaque around braces. It’s proven to be up to x3 as effective as string floss for removing plaque around braces. For use on periodontal pockets and furcations. This tip is composed of a soft rubber tip that is gentle and offers low-pressure delivery of water below the gum line for optimal rinsing. Allows you to save even more time on your daily dental routine by combining brushing and flossing in one! You can use this tip with or without toothpaste for an ultimate clean. Why choose a Waterpik water flosser? Waterpik make the number one recommended water flossers. Waterpik products excel in over 50 clinical studies. Dental professionals trust the brand and Waterpik receive tens of thousands of positive reviews on Amazon. In fact, founded by a hydro-engineer and a dentist, the Waterpik brand is synonymous with oral irrigation. Waterpik have been in the business longer than any other company yet continue to be recognized for award-winning design and innovation. Waterpik inc. are the go-to company for water flossers. And a further study showed that teenagers with orthodontics who used a water flosser had three times the reduction in plaque than those who only brushed. Fill the Waterpik reservoir with lukewarm water, choose and fit your tip and adjust the pressure. Lean over the sink and place tip in mouth at a 90 degree angle just above the gumline. Close lips enough to prevent splashing but still allow water to flow into sink. Starting at the back pass the tip along the gumline pausing briefly between teeth. Waterpik was founded by a hydraulic engineer and dentist in 1962 under the namer Aqua Tec Corp. After 146 tries, the two innovators created an oral irrigator for use in dentistry. Today’s Waterpiks are based on the same principle. A pump sends a pulsating jet of water through a tip to clean the teeth. But that doesn’t mean the innovation has stopped! Waterpik’s designers have engineered dozens of advances into the original design resulting in the range of products you can buy today. And in 2005 the company celebrated the 50th clinical study proving the efficiency of Waterpik water flossers. The fact that Waterpik has encouraged independent bodies and industry professionals to test and challenge its products speaks volumes about its confidence in them. As does the fantastic 3 year warranty! There are huge benefits to using any of these water flossers to improve gum health. All are gentle yet effective for dental work such as braces, crowns, veneers and implants. And all are 50% more effective for gum health versus string floss. View a short video on how to use the Waterpik Aquarius. Learn how to use the Waterpik Cordless Advanced. Gums bleed when flossing? Reasons why & what to do.